Six photographs showing L. Banker Mercantile's employees in Russell, Kansas. 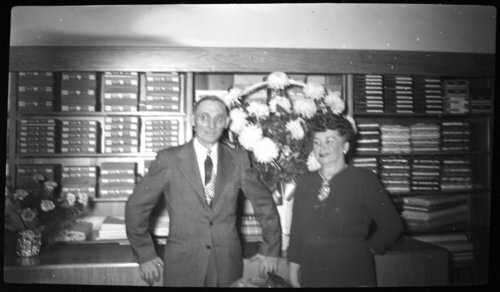 The photographs were possibly taken during the store's 75th anniversary. The people in the large group photograph are: Back row, l to r, Herbert Michaelis, ___, ___, Bernard Marshall, Dean Tuttle, and Richard Dumler. Middle row, l to r, ___, ___, Alex Reissig, and L. Waldo (Wog) Banker, owner. Front row, l to r, Theodora (Ted) Banker, ___, Esther Laubhan (Teague White), Mabel Parish, ___, and Andy Steinle.